Murthwaite Lodges are located in Longsleddale which is one of the of the loveliest and most unspoiled scenic valleys in the Lake District. 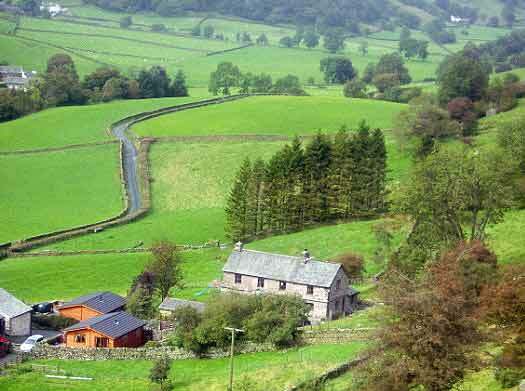 This Lakeland Valley, which runs off the A6 road to the North of Kendal, is a country lover's paradise. The lush green, flower filled meadows are divided by the sparkling waters of the River Sprint, from where the pasture land rises up to the towering Cumbrian Fells. Longsleddale is mentioned in documents dating from early in the 13th century and was once an important packhorse route between Scotland and the south, or towards the west. Now it is a place of peace and a delight to explore. John Cunliffe's Postman Pat stories, well loved by children in books and as a TV series, are set in the fictional village of Greendale which was inspired by the Longsleddale valley.